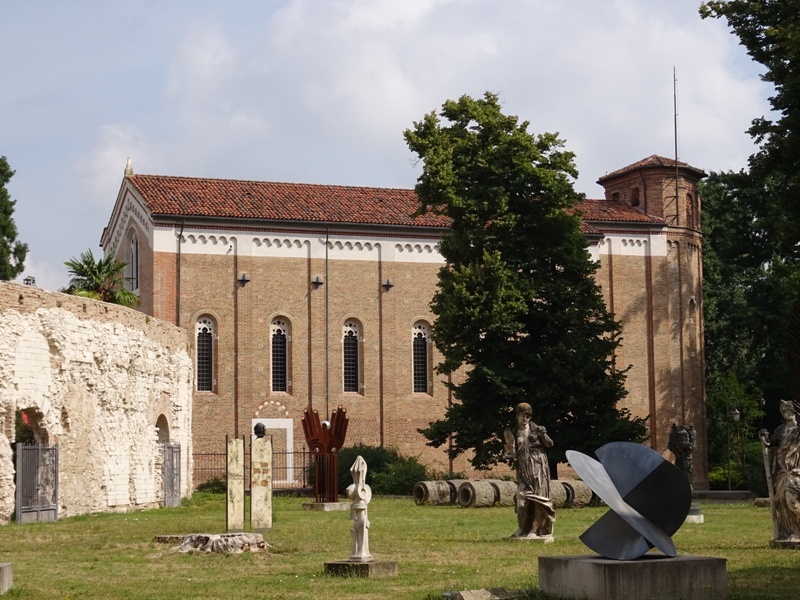 The Cappella degli Scrovegni is arguably Padova’s most famous monument. I had been looking forward to visiting it for quite some time and had made my reservation to see the chapel weeks in advance. These reservations are compulsory, and to protect the vulnerable frescoes inside, a maximum of 25 visitors are allowed in the chapel at the same time. Visitors will be asked to wait in a special climate-controlled room and watch a short movie before they are allowed to enter the chapel. The movie tells something about the history of the Cappella degli Scrovegni and the efforts that have been made to preserve the frescoes. 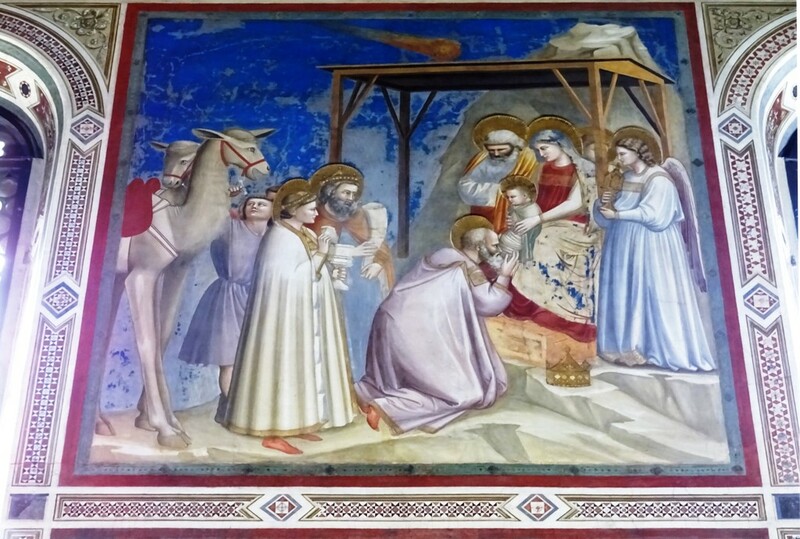 These frescoes, the true highlight of the chapel, are the work of one of Italy’s most brilliant fourteenth century artists, Giotto di Bondone from Florence (ca. 1266-1337). 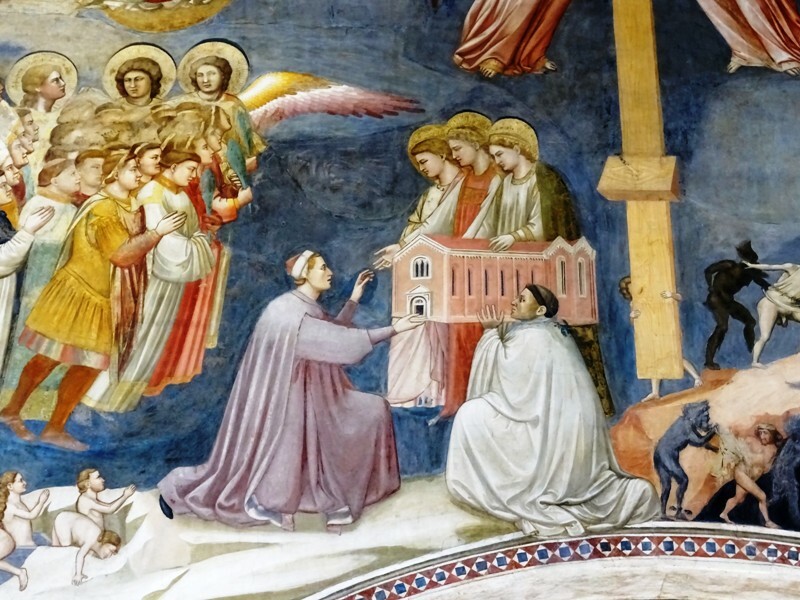 Of course, Giotto did not paint everything all by himself. While decorating the chapel, he worked with assistants and pupils, and he presumably hired some local painters to aid him as well. The chapel was commissioned by Enrico Scrovegni (died 20 August 1336), a rich banker and money-lender from Padova. His father Reginaldo was a notorious usurer who had made a fortune by charging disproportionately high interest rates to his clients. Reginaldo was lambasted for his sins by the poet Dante Alighieri (1265-1321) in Canto XVII of his Inferno. Although he is not mentioned by name, Dante describes how he met “one, who bore a fat and azure swine pictured on his white scrip [i.e. wallet]” in the inner ring of the seventh circle of Hell. The Scrovegni coat-of-arms happens to feature a swine, as the word ‘scrofa’ means ‘sow’ in Italian. So it was obviously Reginaldo Scrovegni whom Dante encountered and immortalised in his epic poem. Procession from the fresco of the Last Judgment. 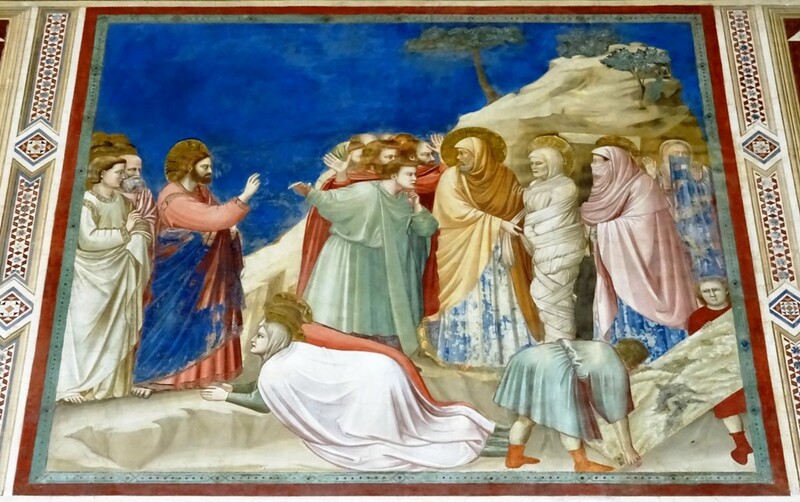 The man with the yellow hat in the foreground is said to be Giotto. On 6 February 1300, Enrico Scrovegni bought a large piece of land from the Dalesmanini family. It included parts of the remains of the ancient Roman arena that had once stood here. A small church had been on this site since about 1278, and every year on 25 March, a mystery play was staged here to celebrate the Annunciation. After buying the land, Enrico had a splendid palace built that followed the curve of the wall of the arena. He then had the small church replaced with a chapel for private worship. Its official name was the Santa Maria della Carità at the Arena, but it became known to posterity as the Cappella degli Scrovegni or simply the Arena Chapel. The most widely held theory is that it was constructed to pay for his father’s sins and those of his own, and to save their souls from eternal damnation. It should, however, be noted that the theory that the chapel was built in expiation for the Scrovegni family’s sins did not come into existence until 1560. The Cappella degli Scrovegni was constructed between 25 March 1303 and 25 March 1305. On the latter date, it was consecrated and could be used for staging the traditional mystery plays once again. The nave of the chapel is some 20 metres deep, about 8,4 metres wide and 12,8 metres high. There are six large windows in the right wall, which let in plenty of light. The name of the architect who built the chapel has not come down to us, but it has been speculated that it was Giotto himself who designed it. This is not impossible: artists in this period in history were generally polymaths, who were quite capable of being painters, sculptors and architects at the same time. We should keep in mind that Giotto became chief architect of the Duomo of Florence in the 1330s and continued to hold that position until his death in 1337. The famous campanile of the cathedral is even named after him. However, we should also concede that there is no concrete evidence that Giotto designed the Cappella degli Scrovegni, so we should not attribute the chapel to him with too much certainty. Enrico Scrovegni offering a model of the chapel to the Virgin. There is, however, no doubt at all that Giotto and his workshop were responsible for the formidable frescoes that grace the walls of the Arena Chapel. The opinion is almost unanimous that the frescoes were completed by the time the chapel was consecrated, so they would have been executed between late 1303 and 25 March 1305. 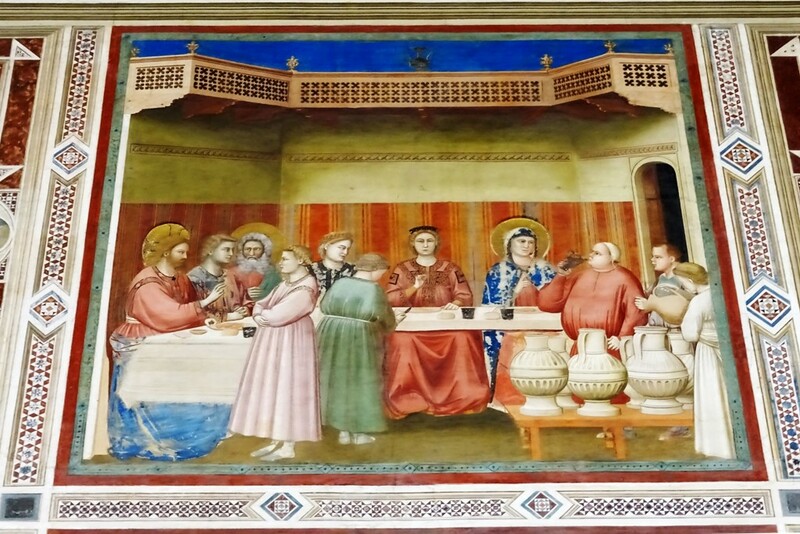 Giotto and Enrico Scrovegni may have become acquainted when the former worked on a chapel in the church of Il Santo that belonged to the Scrovegni family prior to 1303. After finishing the decorations of the Arena Chapel, Giotto moved on to his next and final project in Padova, the decoration of the Palazzo della Ragione, where the city’s law courts held their sessions. Unfortunately these frescoes have not survived. 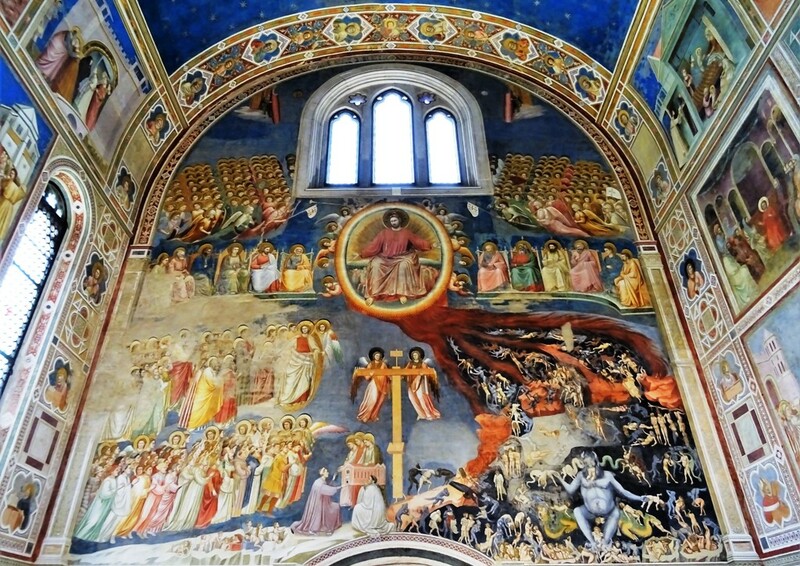 Inside the chapel, Enrico Scrovegni can be seen in the huge fresco of the Last Judgment on the counter facade. 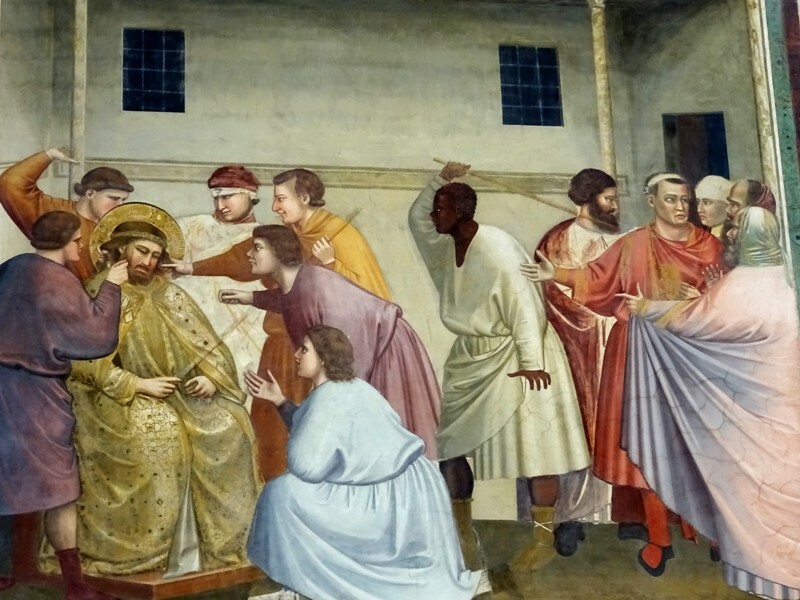 He is wearing purple robes, and purple happens to be the colour of penitence and mourning in the Catholic Church, which lends some support to the theory that Scrovegni had the chapel built to expiate the sins of his family. Enrico is on his knees and can be seen offering a miniature model of the chapel to the Virgin Mary and two other women. The model is held by a man in white robes. If we compare the actual chapel with the miniature model of the fresco on the counter facade, we notice one obvious difference: the model has a large transept which is absent in the real chapel. The explanation usually given is that, already in early 1305, monks from the adjacent monastery and church of the Eremitani complained that the chapel was much too large to be used as a private chapel. Fearing competition, they compelled Scrovegni to reduce his Arena Chapel in size. This also explains why the choir of the chapel, which holds Enrico’s tomb and that of his wife, was decorated later. The frescoes in this part of the church were painted between 1317 and 1320 by a local artist who was not even half as talented as Giotto. The Scrovegni family lost control of the palace and the Arena Chapel in the 1440s. After switching hands many times, the buildings were acquired by the Foscari family at the end of the fifteenth or the beginning of the sixteenth century. The Foscaris were an ancient patrician family from Venice. They turned the estate into an early Renaissance palace, which became the property of the Gradenigo family, also from Venice, in the early nineteenth century when countess Marta Foscari married Pietro Gradenigo. Unfortunately the palace and the chapel were badly neglected. In 1817, the portico in front of the chapel collapsed. The dilapidated palace itself was demolished in 1824 (or 1827, sources differ). The loss of the portico and of the palace, which supported and protected the left side of the chapel, proved to be detrimental to the frescoes. Cracks began to appear in the brickwork and water began to trickle in. When the commune of Padova finally acquired the chapel in 1880-1881, the building was in a very bad state. To be honest, the city then made things worse when it had the layers of plaster and frescoes on the exterior of the facade removed, allowing more water to permeate the walls. Two frescoes inside – Christ among the Doctors and the Ascent to Cavalry – had to be temporarily detached to save them. 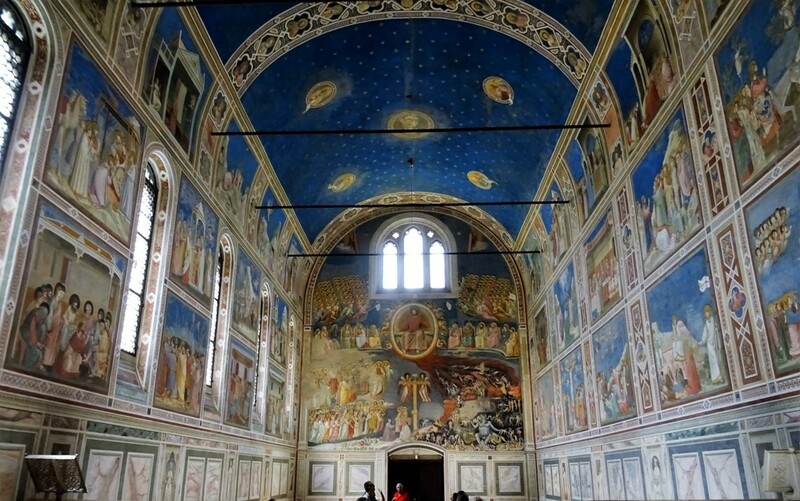 Fortunately, the chapel and most of Giotto’s frescoes are in excellent condition today. Many restoration attempts have been undertaken since 1881, some more successful than others. But the restorations executed in 2001-2002 have made sure that visitors can admire Giotto’s brilliant use of colour and chiaroscuro again. These frescoes truly represent a milestone in Italian art. Gone were the days of Byzantine rigidness. People were represented as people again, with realistic faces and emotions. Giotto, at the time the most famous artist in the peninsula, and his pupils soon began training a whole new generation of artists. One of them was Giusto de’ Menabuoi (died 1390/1391), whose Giottesque frescoes in the Baptistery of the Duomo have already been discussed in a separate post. Like the mausoleum of Galla Placidia in Ravenna, the Cappella degli Scrovegni can be described as a little jewel box. The splendid vault in heavenly blue is decorated with dozens of golden stars. It is divided into two parts, with each part featuring one large and four smaller tondi. Inside the large tondi, we see Jesus Christ and the Madonna and Child respectively. They are surrounded by eight smaller tondi which feature seven prophets and Saint John the Baptist. Brilliant interior of the chapel. The fresco cycle starts on the triumphal arch over the choir. Here we see God the Father surrounded by angels. While the angels were frescoed onto the arch itself, God the Father was actually painted onto a wooden panel, or rather two wooden panels nailed together. I assume the panel we see today in the chapel is actually a copy, the original having been moved to the adjacent Eremitani Museums, the former monastery of the Eremitani mentioned above. Francesca Flores d’Arcais has speculated that the wooden panel was actually a door that could be opened to release a dove symbolising the Holy Ghost during the aforementioned mystery plays connected to the Annunciation. This is certainly possible, but I expect it will remain speculation. The cycle then continues on the right wall, where the top register tells the story of the Life of Saint Joachim, the apocryphal father of the Virgin Mary. In six scenes, we see how Joachim is driven from the temple because he and his equally apocryphal wife Saint Anne have failed to procreate. Joachim then joins the shepherds, while an angel announces to Anne that she will bear a child after all. In the next two scenes, Joachim makes a sacrifice and has a dream. Husband and wife then meet again at the Golden Gate of Jerusalem, where Joachim learns that his wife is expecting a child. The two embrace and kiss in a very touching final scene. Meeting at the Golden Gate. Presentation of the Virgin in the temple. The cycle moves on to the left wall, where the top register is dedicated to the Life of the Virgin Mary. The Virgin is born and presented in the temple. After two scenes featuring the Ceremony and the Prayer for the Miracle of the Rods, we see the Virgin marrying Joseph the carpenter. 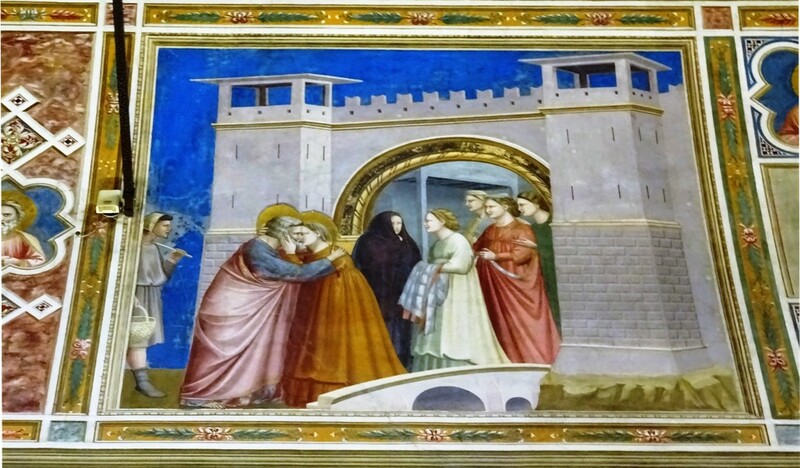 The Marriage of the Virgin is followed by a scene featuring a wedding procession. Also part of the Life of the Virgin are two more scenes on the triumphal arch, just below God the Father surrounded by angels. Here we see a two-part Annunciation. On the left is the angel of the Annunciation – traditionally the archangel Gabriel –, on the right the Virgin Mary. Now we get to the best part of the cycle: 24 scenes related to the Life of Christ. Here Giotto and his team have really excelled themselves. The Life of Christ starts with a Visitation scene – the Virgin meeting Saint Elizabeth, mother of John the Baptist – just below the Annunciation. The story then continues on the right wall with a charming Nativity scene, including animals and shepherds. Joseph is looking pensive, and we have seen that look before. Compare this scene to Pietro Cavallini’s mosaic in the Santa Maria in Trastevere, which Giotto must have seen when he worked in Rome in the late 1290s. The Nativity scene is followed by the Epiphany or Adoration of the Magi. This scene is especially famous because it features a comet high in the sky instead of the more traditional Star of Bethlehem. Giotto was certainly interested in astronomy and astrology – there was no clear distinction between the two in the 1300s – and he would later paint frescoes in the Palazzo della Ragione, already mentioned above, that were inspired by the astrological theories of Pietro d’Abano. In this case, the comet was possibly based on Halley’s Comet, which was visible in Italy in 1301. Adoration of the Magi. Note the comet in the sky. After the Epiphany come scenes showing the presentation in the temple, the flight into Egypt and the murder of the Innocents, the latter featuring a strange octagonal building that somewhat resembles the Baptistery of San Giovanni in Florence. The first scene of the middle register of the left wall is Christ among the Doctors. It has already been mentioned above, and unfortunately its state of preservation is still not very good, although it could have been lost altogether. After the Baptism of Christ comes one of my favourite scenes, the Wedding at Cana. Here we have the ultimate proof that Giotto painted the figures in his frescoes as individuals. Just take a look at the wine taster, a short man with a huge belly that looks like it might explode any moment. The register then continues with Christ raising Lazarus, Christ entering Jerusalem – note the people in the trees! – and Christ expelling the money-changers from the temple. Christ is now at the peak of his success. The Flagellation of Christ (detail). But then things start to go all wrong. On the triumphal arch is a scene of Judas betraying Jesus to the priests for thirty pieces of silver. We then move on to the Last Supper in the lower register on the right wall, which is followed by the washing of the feet. Christ is subsequently arrested and gets a kiss from Judas. He is brought before the high priest Caiaphas and is scourged in one of the most impressive scenes of the entire cycle: the Flagellation of Christ. 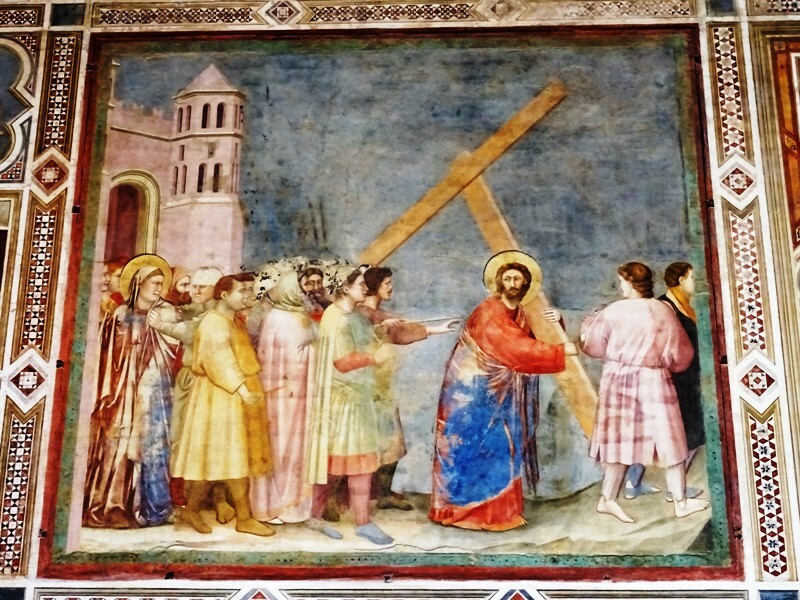 Several people are beating and teasing Christ, among them a black man who is wielding a stick, the only coloured person in the entire fresco cycle. On the right is the Roman prefect Pontius Pilatus – Pilate in English – whose head is apparently based on the bust of a Roman emperor. Moving back to the left wall again, we see an Ascent to Cavalry in the lower register– impressive, but damaged (see the image above)– followed by a very moving scene of the Crucifixion. 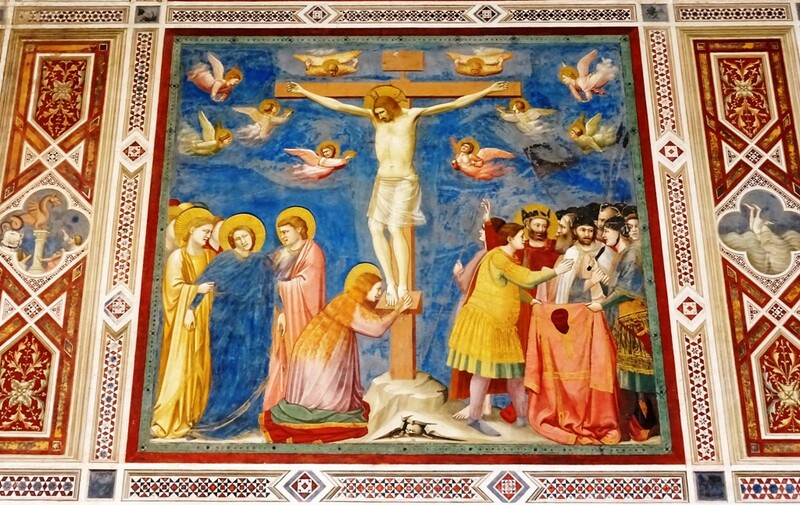 Christ on the cross, wearing just a loincloth, looks quite serene, with Mary Magdalene kneeling and touching his feet. Near the base of the cross we see a skull, a reference to Calvary or Golgotha, the ‘place of the skull’ of the Bible. On the left, the Virgin Mary seems to have fainted and she has to be supported by a woman and a man, the latter presumably John the Evangelist. On the right, Roman soldiers are bickering over Christ’s robe. The man with the halo is the centurion Longinus, who according to tradition later converted to Christianity. The next scenes show the Deposition, the Resurrection, the Ascension and finally the Pentecost. The Resurrection scene is especially good, with Christ holding a banner with the Latin text victor mortis, ‘the victor of death’. Mary Magdalene wants to touch him, but he rejects her: “Noli me tangere”. 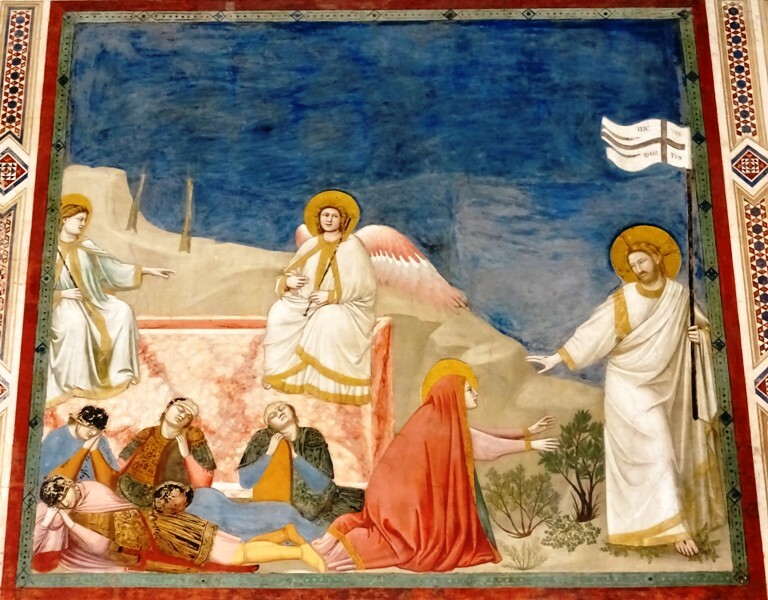 In this fresco, Giotto also shows his mastery of foreshortening. The sleeping soldiers obviously inspired Piero della Francesca (ca. 1415-1492) when he painted his version of the Resurrection some 150 years after Giotto. The scene of the Pentecost closes the cycle about the Life of Christ. But there is much more to see in the Cappella degli Scrovegni. The huge fresco of the Last Judgment, which occupies the entire counter facade, is much more traditional than the other frescoes in the church. 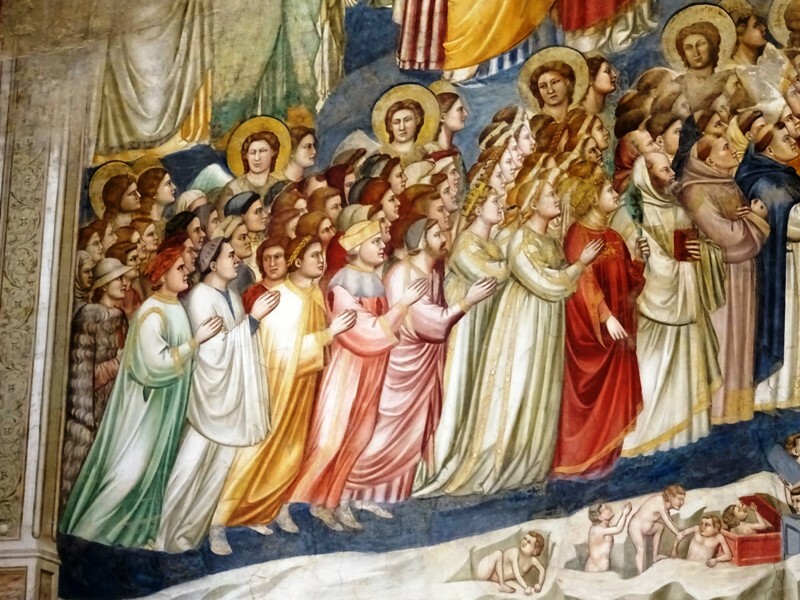 The way Giotto depicted the masses of angels and people resembles his altarpiece in the Baroncelli Chapel of the Santa Croce in Florence. Individuality is less important here. And yet, there are quite a few interesting details in the fresco. 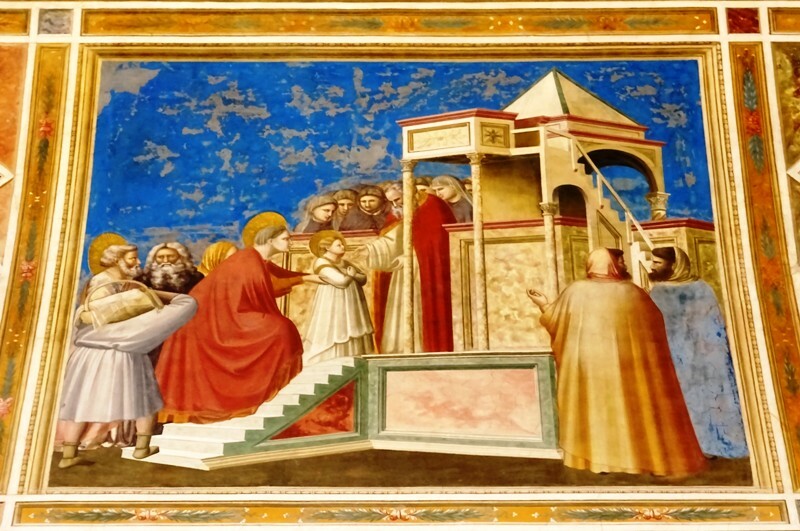 For instance, Giotto is said to have painted himself in the solemn procession of people on the left progressing towards Enrico Scrovegni (see the image above). Quite a few sources claim that he is the man with the yellow hat, but unfortunately none of these sources explain how they get to this conclusion. Another charming detail can be found near the top of the fresco, where two angels are unfolding a scroll of the Universe with the sun (left) and the moon (right). The middle left part of the Last Judgment is somewhat damaged, which is a pity. The fresco shows Christ the Judge seated inside a mandorla, presiding over the Heavenly Court composed of the Twelve Apostles, six on either side. 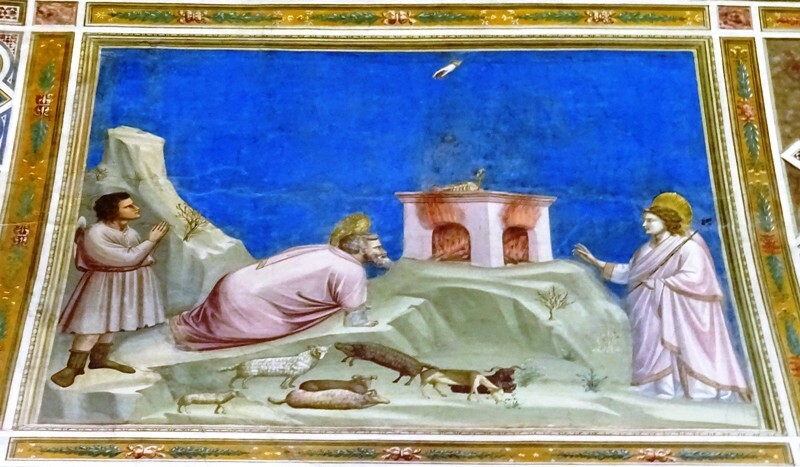 There can be no doubt whatsoever that Giotto was inspired by Cavallini’s depiction of the same subject in the Santa Cecilia in Trastevere in Rome. 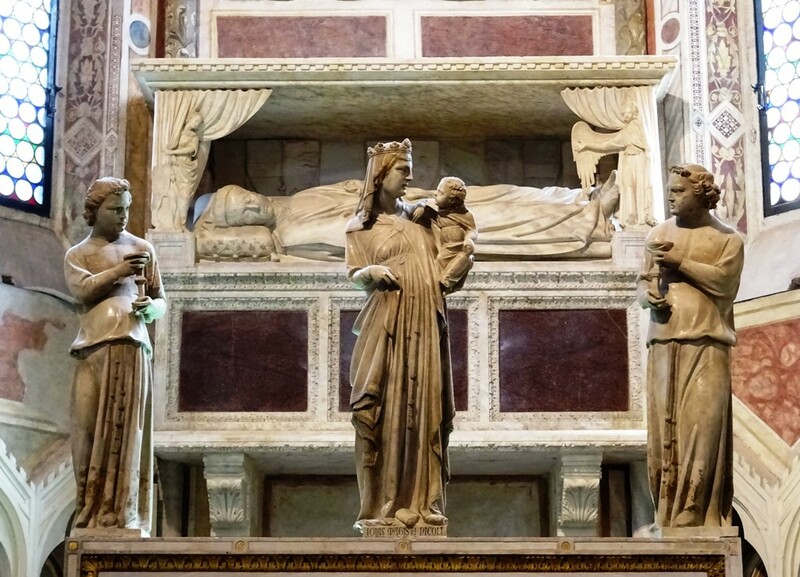 As with the Santa Maria in Trastevere mentioned above, the Santa Cecilia must have been a church the artist visited during his sojourn in the Eternal City at the end of the thirteenth century. The depiction of Hell in the lower right part of the fresco, on the other hand, must have been inspired by a similar scene in the huge ceiling mosaic in the Baptistery of Florence, also already mentioned above. Giotto must have been well acquainted with this part of the mosaic in his hometown, made between 1260 and 1275 (there is in fact speculation that he contributed to other parts of the ceiling). His depiction of the man-eating Devil is certainly very similar to that in the Baptistery. And just like the mosaicists of the Baptistery did, Giotto included Judas in the scene. 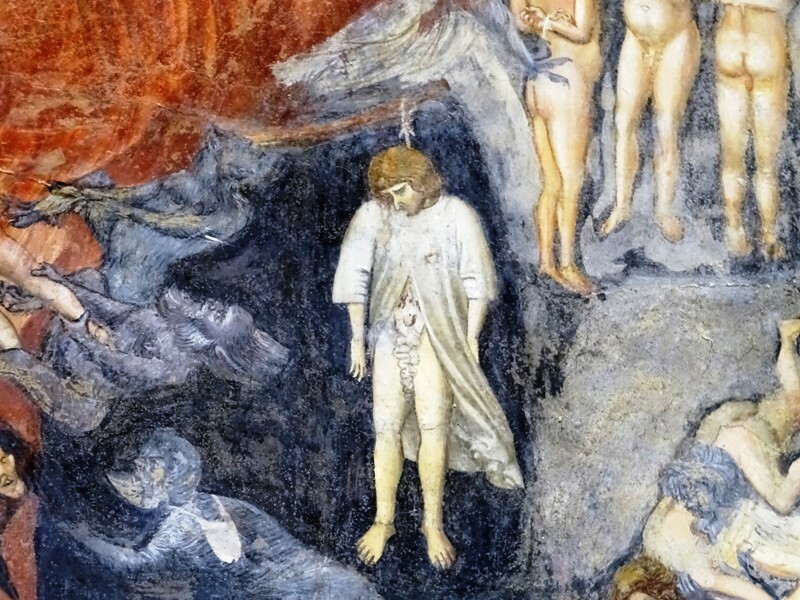 The former disciple has hanged himself, but Giotto’s depiction is much more graphic than that in Florence: the fresco shows Judas with his bowels gushing out. Easy to miss are the smaller frescoes, inside quadrilobes, which are related to the stories from the Life of Christ on the left wall. These frescoes all show scenes from the Old Testament that – according to Christian doctrine – prefigure episodes in the life of Christ. For instance, the small scene of Elijah in the fiery chariot (2 Kings 2:11) prefigures the Ascension of Christ, while the scene of Jonah swallowed by a sea monster prefigures the Deposition. Other quadrilobes for instance show the Creation of Adam from Genesis (connected to the Raising of Lazarus), the Bronze Serpent (connected to the Crucifixion; cf. John 3:14) and Moses at Mount Sinai (connected to the Pentecost). Although the chapel has only one choir and apse, Giotto painted two more trompe-l’oeil apses onto the triumphal arch. ‘An exercise in perspective’, according to one of my travel guides, but I somehow doubt the master really needed such an exercise. Below the frescoes of the Lives of Joachim, the Virgin and Christ are fourteen more frescoes depicting the Virtues and Vices. The right wall has the seven Virtues: Prudence, Fortitude, Temperance, Justice, Faith, Charity and Hope. On the left wall we can admire the seven Vices: Folly, Inconstancy, Anger, Injustice, Infidelity, Envy and Despair. These frescoes are painted in monochrome and resemble classical marble statues, but with a twist. They are, according to Francesca Flores d’Arcais, “a Gothic interpretation of the classical world, reminiscent of Giovanni Pisano”. Fides (Faith), Infidelitas (Infidelity), Karitas (Charity) and Invidia (Envy). Giovanni Pisano is, of course, the sculptor Giovanni Pisano (ca. 1250-1315), one of the foremost sculptors of his age. Pisano is best known for his beautiful pulpit for the Duomo of his native Pisa, as well as for working on the facade of the Duomo of Siena for a while (the sculptures he made are now in the Duomo Museum). But the artist also worked in the Cappella degli Scrovegni, sculpting the elegant statue of the Madonna and Child for the choir, as well as the two deacons with candles on either side of the Madonna. Traces of blue paint have been discovered on the Madonna’s mantle, while gilding has been found on other parts of the statues. In other words, these statues were once brightly coloured. Now we just see the Carrara marble, which is nonetheless beautiful. Behind the statues is Enrico Scrovegni’s tomb, where he and his wife found their final resting place. Scrovegni will be remembered, there can be no doubt about that! Tomb of Enrico Scrovegni and statues by Giovanni Pisano. This post is mostly based on two publications: Francesca Flores d’Arcais, ‘Giotto’, and ‘Giotto en de kunst in Padua in de 14de eeuw’, to which several authors contributed. “A mediocre Paduan painter with Giottesque leanings’, according to Giotto expert Francesca Flores d’Arcais (Giotto, p. 139). Matthew 27:5 says that Judas “went away and hanged himself”, while Acts 1:18 claims that the former disciple “fell headlong, his body burst open and all his intestines spilled out”. 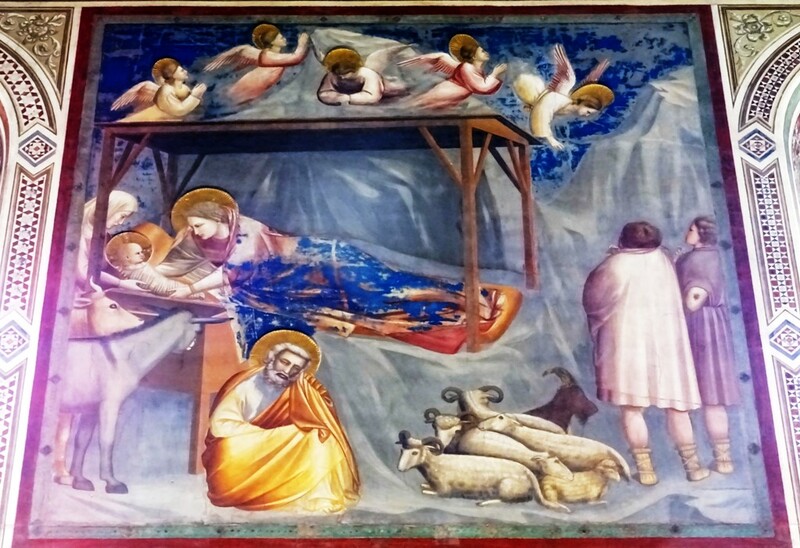 Giotto combined the two traditions.